Shokuzen-shu – to start off your meal, you may be offered a small glass of alcohol — this aperitif may consist of sweet wine or a local alcoholic beverage. Sakiduke – these hors d-oeuvres are typically beautifully prepared, bite-sized tastes that serve to whet the appetite of the diner. Wanmori (or suimono) – this is a very light soup that is served before the main dish. Tsukuri – this course consists of sashimi-style (no rice) raw fish, thinly sliced and usually accompanied by soya sauce and a small amount of wasabi paste. The Tsukiji Fish Market in Tokyo is definitely worth a visit, if for nothing else than to see the early-morning tuna auctions. The complex is enormous (it makes the old Fulton Fish Market in New York City seem like child’s play) and contains hundreds of vendors selling tremendous quantities of super-fresh fish. You will have to register onsite to gain access to the auctions. The registration office — on the 1st floor of the “Fish Information Center,” located by the Kachidoki Bridge entrance — opens at 5:00 am. There are only 120 visitors permitted per day, so be sure to arrive at the registration location a little before it opens (4:30 am will assure you a spot). Tours of the auctions are offered at two times: (a) 5:25-5.50 am; and (b) 5:50-6:15 am. It is closed Sundays, national holidays and frequently on Wednesdays. Visit the official site of the Tsukiji fish market for more details. 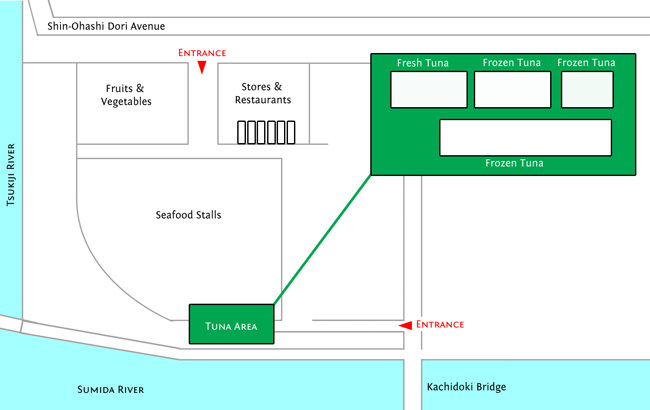 For your convenience, we have also marked the location of Tsukiji in Google Maps. After spending the morning walking around Tokyo’s famous fish market, take your breakfast at Daiwa Sushi, the quintessential place to go for a reasonably priced sushi breakfast. There are only 8 seats, but it is a great and totally unique experience. A helpful resource for any visitor to Japan is our guide to sushi and sake. This ebook gives travelers a glossary of different types of sushi and sake, and tips that range from how to order and eat sushi at a restaurant (dip the fish side, not the rice side, of a piece of nigiri sushi into soy sauce) to alcohol pouring etiquette (pour for others, not yourself).